He’s played on the national team since he was 14 years old. Now 32, Billy Bridges has played pretty much every role possible for the Canadian Sledge Hockey team. He’s been the young speedster, the agitator, the big hitter and the finesse player. 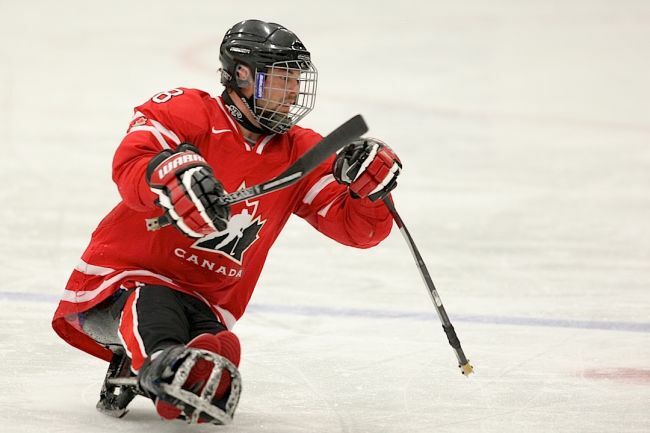 Monday afternoon, he played goal scorer, netting two in Canada’s 5-0 win over Norway on the second day of preliminary games at the 2015 IPC Sledge Hockey World Championships in HarborCenter. But Bridges will play whatever role he can to be part of Team Canada and stay at the elite level of his sport. He had to adapt again this year, left off the roster for the World Sledge Challenge in February. But that’s part of the growth of the game, which Bridges sees as a positive. Reunited: Bridges is playing again with Greg Westlake and Brad Bowen. The line has scored 14 of Canada’s 22 goals through the first two games. The trio played together in Sochi where they lost to the U.S. in the semifinals and defeated Norway for the bronze medal. “You can never give those two enough credit,” Bridges said of his linemates. “They’re two of the best players in the game. Brad can feed a pass anywhere and Greg is always in the perfect spot. I’m so lucky. There’s always two levels of support. There’s always a guy available for a pass and then there’s a guy going to the net. And I know too if I drive the net, I’m going to have guys support me behind me. I don’t know. We just seem to have that chemistry of knowing when to go with a guy, when to stay back on D. Even on our breakouts, we’re mixing up our positions all the time. Czech Republic nabs win: With two goals from Michal Geier, the Czech Republic picked up its first win of the tournament, 2-1, over Japan. Masaharu Kumagai scored a late power play goal for Japan, which fell to 0-2.